Olivia shared her special day with all her friends at Gymnastics on the weekend. If you are thinking of something special for your child’s birthday, give us a call on 436 55545. Last week end saw the NSW Acrobatic State Team run through their paces at a training camp held at Gosford Gymnastics. After another fun weekend of competition, congratulations to all the gymnasts who attended the competition. 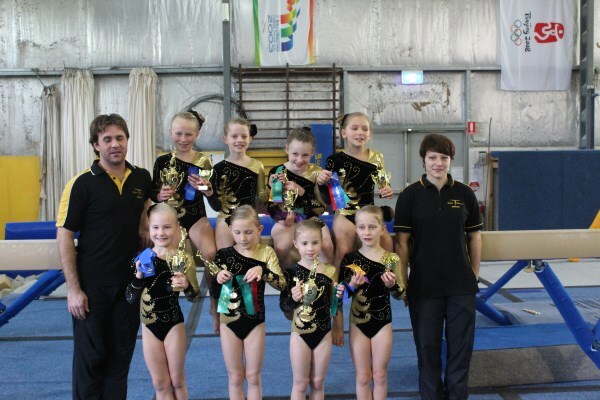 Here are some of the Gosford Gymnasts who competed on Sunday. Great job girls, you did yourselves proud. Emily Gale one of our Senior Acrobats was named State Team Vice Captain at the recent State Titles. We are very proud of you Emily. The girls are off to NATIONAL CHAMPIONSHIPS !! Our Acrobats of Emily Abbey & Danni Level 7 Women’s trio and Kate Bella & Celest Level 6 Women’s Trio have all qualified to compete in the NATIONAL CHAMPIONSHIPS. Congratulations girls. NEWS UPDATE ……….The girls have all qualified at the State titles and will now represent NSW at NATIONALS!!!!!!! Come and join us in ACROBATICS! Holiday Gym … It’s on again!!! We are running a Holiday Gym program these April School Holidays. Lachlan & Joshua had a great night out!! Here are some of our Junior Cheerleaders learning new stunts. We have a senior team as well who are also looking for new members. Call us on 436 55545.